We’re thrilled that our Moon Gazer Pacific Pale will showcase North Norfolk beers at this year’s Great British Beer Festival (GBBF). The GBBF is the biggest beer festival in the country and takes place at Olympia, in London 7-11 August. However, while team Moon Gazer is immensely proud to be selected, it may never have happened, had not one of its team been diagnosed with coeliac disease! You see, the history of this particular beer starts a little over a year ago when Cathy who has worked at the brewery for five years was told by doctor to cut gluten out from her diet and that included the beers from the brewery. It really made an impression on us, as we were able to see first-hand someone who is so passionate about beer suddenly have that passion denied. 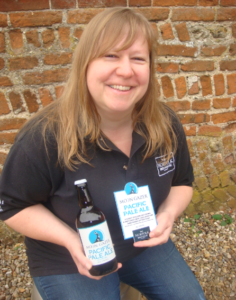 Fear not, we came up with a plan to create a gluten free beer so Cathy could once again drink their beers, as stop giving us a running commentary of which gluten free beers she was trying – some great, some not so but kept asking us why we couldn’t brew a beer for her. Well, the challenges was laid down and we set about creating a special beer which matched Cathy’s preference – love for soft, yet fruity golden pale ales. Interestingly the beer doesn’t use gluten free ingredients – and has as its base Norfolk Maris Otter barley but the addition of an enzyme reduces the gluten element to below 10 parts per million which is below the gluten free threshold. The result is a beer which has the same tasty, malty backbone as the brewery’s other beers. Cathy just loved it straightaway – saying it was like we brewed it just for her. Well we kinda did but sharing is cool! We decided as a team not to tell the pubs or public it was gluten free until after a few months by which time it was established as a firm favourite, this worked really well and stopped people pre-judging it, as often GF products can be disappointing.